TALLAHASSEE, Fla. - Colleen Washington had never seen the inside of an emergency shelter before Wednesday. She hadn't planned on it, either, until the clouds darkened and the sirens blared and a police officer yelled that everyone in her tiny inland neighborhood needed to leave. "In my 58 years, I have never evacuated," she said to an old friend, who also was taking refuge inside the gymnasium at Lawton Chiles High School in Tallahassee. "But, girl, we had to evacuate. I have grandchildren, and I needed to go." As Hurricane Michael barreled toward Florida's Panhandle, an unfamiliar feeling struck the state's hilly capital city Wednesday morning: panic. Eighty miles inland, residents were used to the dangers of downed trees and power lines. 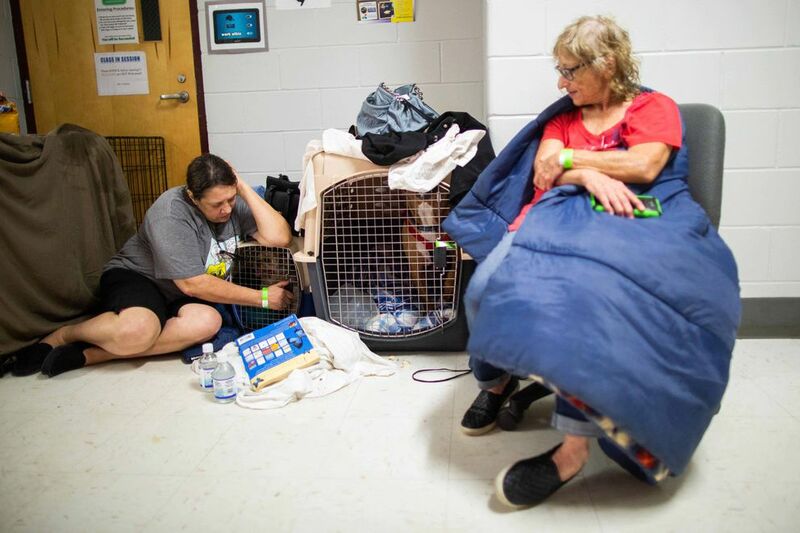 But after the hurricane was upgraded to a life-threatening Category 4 storm overnight, residents rushed to the city's largest hurricane shelter. About 100 people were inside Tuesday night. 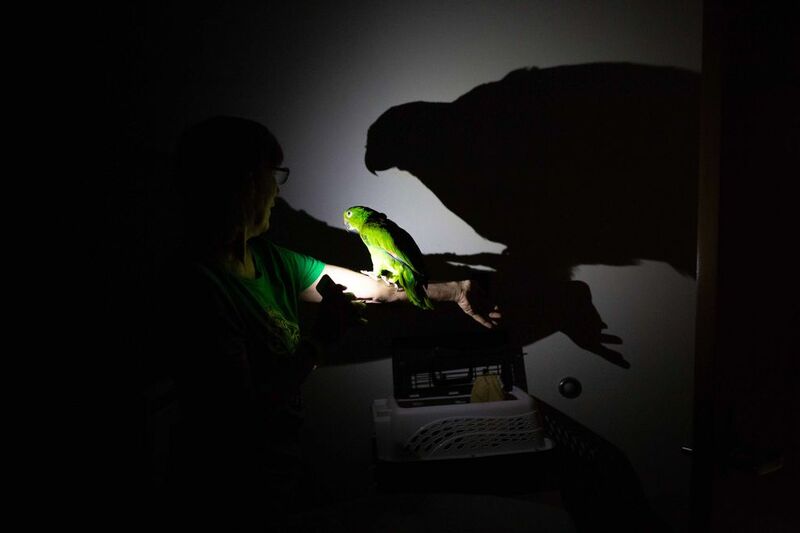 By Wednesday afternoon, there were 330 residents, 149 cats and dogs, and one parakeet. Many of the residents had reached the gym in the moments before the doors were closed. "I was scrambling," Washington told her friend as she recounted her family's rush to safety. Her daughters picked up all the water bottles in their home and some vienna sausages. Her granddaughters gathered up their tablets and some crossword puzzles. They packed their pit bull, Gracie, and traveled 30 miles to the largest shelter in Tallahassee. There, they joined dozens of others hustling to get inside before the gym doors closed at noon. Thomas Haygood, a librarian, and his girlfriend, Brigitte Gonzalez, a billing specialist, followed the signs on the high school campus that said, "pet-friendly shelter" with their two soaking wet bloodhounds, Holly and Scarlet. "We weren't sure we were going to make it," Gonzalez said. "We were going to be in big trouble." They live on the second floor of a squat, two-story stucco apartment building with a floor-to-ceiling window in the living room. Their first instinct was to move their twin mattress to the hallway to escape any injury if the window broke. Then, they thought it might be better to move the mattress to protect the window from shattering. Eventually, Haygood's sister in Birmingham, Alabama, called and told them to get out of the apartment. They called a couple hotels but didn't have the money to pay for them. So they chose the hurricane shelter. They just grabbed what they could: frozen water bottles, some Gala apples and mixed nuts. They gave Holly medication to keep her calm and hoped Scarlet wouldn't betray her natural fondness for people. "I never thought I would live through something this bad," Haygood said. "It all still doesn't make sense." 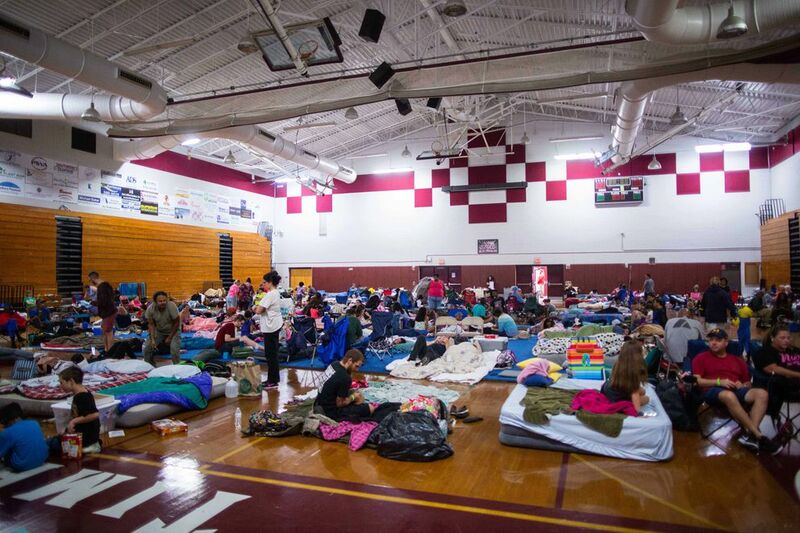 The gym had filled with tents, inflatable mattresses and sleeping bags. Some residents came with walkers; others carried strollers. 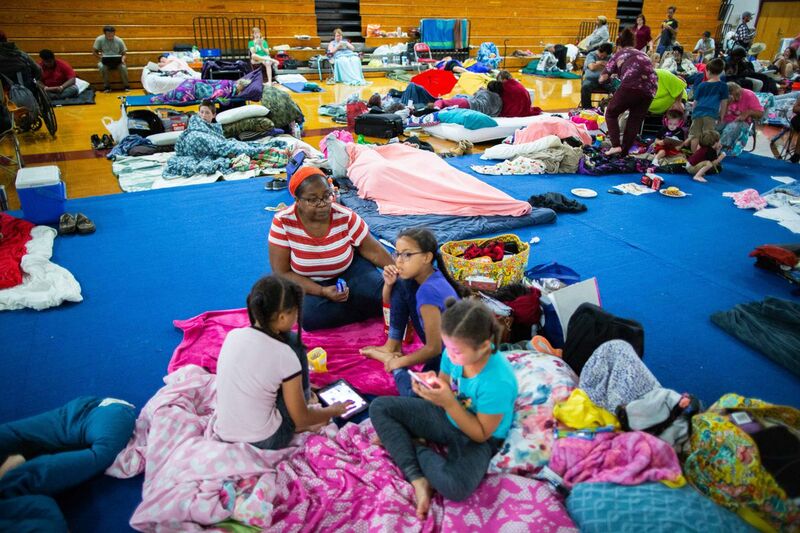 On one end of the room, a handful of evacuees watched an expanding, animated cone churn on cable news; on the other end, an 11-year-old set down some blankets where he placed his 32-inch television to play video games. "At least it's orderly here," Washington's friend, Dorothy McCaskill, said. She had been to this shelter three times in three years. Her neighbors came, too, and it was just as well, since they lived close to the school. "When I moved here 20 or 30 years ago, we didn't have these tornadoes and hurricanes in this part of Florida," McCaskill said. "Now we get one every year. It's just nature now. Everything is changing." Washington doesn't remember ever feeling remotely frightened about an act of God. The closest was Hurricane Kate in the 1980s, when a tornado uprooted a tree in her backyard and it crashed through her family's house. Still, no one was hurt. But she was a grandmother now and lived in a home surrounded by 26 pine trees. She had shuddered to think of the damage that could be done to her backyard, so she moved the lawn furniture and the barbecue grill into the garage. Then came the call for her to evacuate, and the harsher realities of a life-threatening storm began to settle in. Instead of thinking only about her furniture, she started thinking about her home. "We have to evacuate," she was screaming around the house, and now her grandchildren were nervous. Her youngest, 6-year-old Chyla, started to cry. The sudden rush of nervousness forced them to take an unexpected stock of their lives and what was important. Around them, others made similar calculations. They took coolers of quickly made tuna sandwiches and their flat-screen TVs. A teenage girl stuffed notes of affirmation in paper bags and gathered her favorite pillows. "It was amazing to look at a house full of stuff and think you only need a few things," Washington's daughter, Cinta Sheffield, said. "We had to humble ourselves to think about what's truly important." Washington scanned the room at the shelter. Around her was a racially mixed crowd, of all ages, all under a gym roof and looking to do little more than survive. She was glad to have seen an old friend. But she was thankful to see so many strangers living together peacefully. "Everything now is Republicans and Democrats," she said. "But sometimes you need a reminder that we are just people." A man started laying a blue blanket behind her. Jerrith Davis, 23, interrupted her. "You know I survived Harvey?" he said. He told her that he was living in a tent an hour outside of Houston and then had to evacuate. Since then he moved from hurricane shelter to homeless shelter to an apartment that burned down, moving farther and farther east. He and his girlfriend of seven years had been living in a tent in Tallahassee since July, until the shelter opened. "I'm happy now," Davis said. "I'm good because I got ninety dollars in my pocket, and air in my lungs and bread in my belly and a roof over my head. I'm a little nostalgic now because I remember what it was like to be able to take a shower and have food and see people smiling." It was about 3 p.m. The shelter had extended it hours to take in more residents, but now, opening the door was too dangerous. The rain pounded on the roof and the television lost its cable feed. The worst had come. The wind howled and the lights on the gym scoreboard flickered. The power went off and a generator kicked in. The wind howled against the doors. Washington's eyes widened. Her grandchildren held each other and gasped. "You hear what's going on outside," she said. "I'm glad we are inside." And then she took a scoop of Cheez-Its for herself.